Here are the learning objectives that will be assessed in the final exam, along with the overall user-centered design process and its major steps. Explain the basics of what CSS is and what can be done with CSS. Please find below the learning objectives for the topics covered in the final exam. Apply Nielsen’s 10 heuristics to critique interfaces. 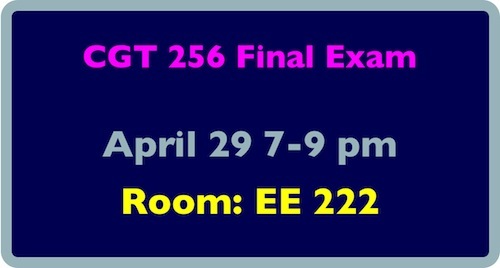 The final exam will cover concepts discussed since the midterm, but also the user-centered design process in its entirety. Click the Lecture Summary tag or category name on the right to see all of Dr. V’s slides and notes from each class session. In addition to the blog notes, you are expected to master content from your notes during class discussion and, of course, the readings. Usability principles for homepage and navigation design – what are the main questions the homepage and navigation should always answer? How are these implemented? Menus & controls – what are the major types of menus and controls? For example, is a checkbox a selection, imperative, entry, or display control? Writing for the Web – what are some guidelines for writing for the web? What is the inverted pyramid style? Why don’t users read online? Nielsen’s 10 heuristics – if I give you an example, and a list of possible heuristics it violates, can you identify the correct one? Usability evaluation – usability inspection, focus groups, cognitive walkthroughs, usability testing. What are these, how are they done, what are the steps? Cross-platform & mobile – what are some major issues to consider when: designing across platforms; designing for mobile? What is responsive design and how does it work? The overall user-centered design process. Please feel free to collaborate on questions & answers related to the final exam in the comments below.